BIGFOOT WARS 1: The TRUTH? You Can't Handle the Truth! Latest Paulides Hoopla. Propaganda vs. Research. Hello, GCBRO. Blogsquatcher Retires! "Everyone has a right to their own opinion, but no one has a right to be wrong about the facts. Without the facts, your opinion is of no value." "You're doing a great service to the subject, and everyone else involved in it." BIZARRO NEWS! 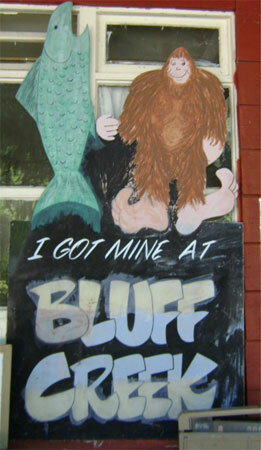 THE BATTLE FOR TRUTH IN BIGFOOTING. 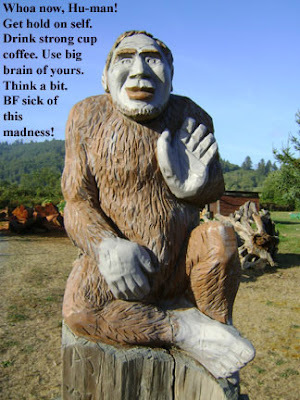 First, sadly, we must announce the retirement of one of the most interesting and intelligent writers in the Bigfoot field, THE BLOGSQUATCHER, D. B. Donlon, from Bigfooting. Whether this is due to frustration with the human involvement with the Phenomenon, or frustration with the mysterious nature of the Creature itself, is not entirely clear in his last blog post. It seems that exploration of this phenomenon has taken him too far out there for one to handle with the normal human faculties of perception and logical reason. Is there something "sinister" about the Bigfoot phenomenon? Or is it just another animal living on the earth as we do? Well, we'd be the last to deny that reality is much, much weirder than we can currently comprehend. The interior reality of the human mind is perhaps the weirdest domain known, this side of Quantum Physics. So, who knows? We'll give him a round of applause for dealing with these issues questioningly, without becoming a dogmatic "true believer" in any one theory or religion, or other ideology. "In fact, I am now retired from looking for bigfoot in any capacity from here out. For me, bigfoot has become not less of a mystery since I started looking into it in 2004, but much, much more mysterious. I despair of actually ever discovering what lies at the bottom of the matter. I leave you with this last thought -- if, as it seems to me, there is something deliberately deceptive about the bigfoot phenomenon, there always remains the possibility that your best interests are not taken into account when you participate in it. If I look at a squirrel outside my window right now, I am sure that what I'm observing is a squirrel. I am confident that I am not deceived. But if I look at a bigfoot, or any other mystery humanoid, I do not know what I am looking at. Indeed, I am sure that I am being deceived in some way. It is my intention not to participate in that deception any further, for I recognize that by blogging about it, I am fostering that deception, even if it isn't my wish. I do not desire to be used by something when I am completely ignorant of the motives, or even the essence of what I'm being used by. 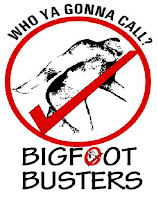 I do not know that investigating bigfoot or other mystery creatures is a harmful exercise, it's just that I don't want to wander around blindly, not knowing who or what I am bumping into, or stepping on (or what I am stepping in!) in a karmic sense." Is it something in the human mind that causes this problem, or is it something in the Creature's nature that inherently messes with the human mind? You decide. If you haven't followed this blog, go dig into the archives. You're in for a wild ride! CLCK HERE TO START: THE BLOGSQUATCHER. UPDATE!!! SADDER NEWS: The Blogsquatcher page and all of its archives have been REMOVED from the internet by Donlon. Does anyone have copies of this stuff? We never saved it to disc as we'd thought he'd be blogging and squatching forever. If you have them, please send us copies. "Whatever we may think bigfoot is, as I have mentioned before a few times, we are subject only to our freewill to believe or disbelieve the evidence proffered. Even those who have witnessed bigfoot in the (apparent) flesh are in the same boat -- without physical evidence, they can really never be sure that the creature they saw was there, or whether some highly unusual mental state -- a mental state so unusual that it continues (if it exists) to be uncatalogued by science -- caused them to believe that it was. This total and impenetrable uncertainty strikes me as the fundamental enigma." 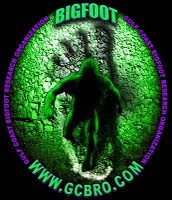 Earlier this month an emailer commenting on one of our earlier blog entries said, "I was surprised to find out that there is in fact a large group of people who actually believe in Bigfoot," much less try to find one or seriously research the subject. Well, there is such a group, and we are everywhere. If this fact is surprising to an outsider, just imagine what they would think if they only knew what dissension and factionalism, not to mention how much fantasy and outright delusion, exist within the inner circles of the field. 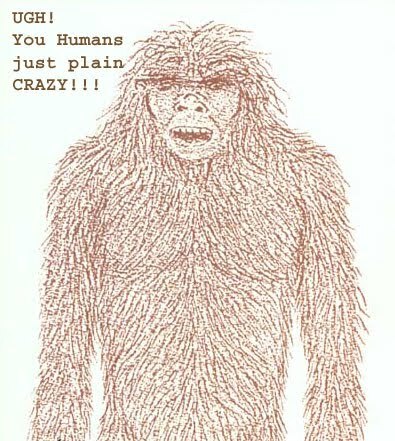 Granted, by our own experience, the vast majority of Bigfoot researchers or hobbyists are sane, often very intelligent, and generally immensely curious in a positive way about the world around them. However, it is the loud, contrary, outrageous, outlandish voices that seem to stand out sometimes. For every Searching for Bigfoot, Inc. Bigfoot Body Hoax seen on CNN--by which the public generally knows us--there are hundreds of sincere, honest and straightforward seekers of truth in books, online, and in the bush, within the Bigfooting field. What is remembered by those not deeply involved, though, is often the most ridiculous stuff. Serious research is often considered too boring to hold TV ratings or short attention spans. How many in the public want to know about the mid-tarsal break and foot anatomy? No, it is blood, gore, the hunt, bodies, and monster attacks that folks want to hear about. What is really sad, to us, is when the crazy things within the esoteric domains of the field are even crazier than the craziness that the public imagines Bigfooting to be. Exempli gratia: The Bluff Creek "Massacre" Theory. Thank whatever gods you believe in that that one has not yet made it onto the 24-hour cable news cycle! One must choose one's allies in this field, and choose them well, for taking any side will inevitably make some vociferous enemies. We, ourselves, have only ever sought to debate points at issue sensibly and with logic and vision; but there are some for whom a disagreement becomes a personal issue of heated argument, whose egos seemingly cannot handle anyone contradicting one of their dogmatic articles of faith. For instance: just mention that Bigfoot is not human or hominid, and soon enough Bobbie Short and her minions will be out to get you. Here productive discussion degrades into acrimony and hysterical ad hominem straw-man attacks, or outright denial of fact and reality. Sometimes in the world of Bigfooting one can feel as if one is surrounded by a sea of craziness, squalls of illogic, storms of delusion, a positive typhoon of BS. One longs, often, for some stable island, a ground of reason on which to stand or take shelter from this lunacy. One often wonders, What am I doing here in this field? I'd thought I was only interested in unknown hairy primates! Trained as we are in Philosophy and Critical Theory, one often wonders how people can say and do such things as they do and think they can get away with it. Where bad ideas and unsound reason are put forth, or PR campaigns of a hoaxing or propagandic nature arise, one feels compelled to respond. Respond we must, or else leave the field. Response, though, in a field without a body, without "proof" and mainstream scientific acceptance, without PEER REVIEW, is likely only to get one into a tormentuous argument. In the absence of tangible evidence, or the ignorance of it, wild theory, speculation, and egotism can take over. It is often a secondary form of psychosis, one stemming from a prior problem that has compelled one's adversary toward the peripheral forms of knowledge and experience. 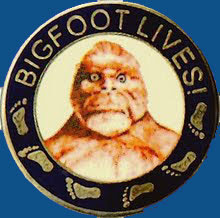 It is not crazy to believe in Bigfoot, we say; but it is a bit off base to assume that a deeply felt opinion constitutes evidence, or that a fleeting feeling or vision can approach proof that can be shared with others and established as fact: id est, the "Psychic Sasquatch" or the Trans-dimensional Shape-Shifting Furry-Alien-from-a-UFO Bigfoot. These things may be true, we suppose, but perhaps we should try to understand the basic thing that leaves footprints in the ground first? Just a suggestion.... It is in areas that humanity and its science do not hold a firm grasp that one must be most careful when making speculations and theories. Look at the New Age field, for instance--with little more basis than a dream or a vision or a drug trip or something seen in meditation, whole histories and pseudo-sciences are constructed. And then, once they are published, these tenuous graspings are quoted as if they are fact, and new elaborations venture out into la-la land with absolutely no evidence but belief. Has anyone ever seen Atlantis, for instance, or are there any valid first-hand sources in history confirming it? No, but still hundreds of books have been written about the subject. Ultimately, this is conterproductive--without something concrete that can be replicated and analyzed by others of our species also living within contingent history on a three-dimensional Earth we are lost. In any other serious field of research unsound theories and published inaccuracies would be discrediting grounds. One major false conclusion, or experimental result that cannot be replicated, and one is doing attempted Cold Fusion in some dingy garage for the rest of one's days. It can be a career killer. Somehow, though, in the Bigfooting field, there are those who feel they can say whatever they want, whatever they FEEL, without regard to the established facts, without citing sources, without having to learn the parameters and basics of the field before they start speaking or writing. Such a case, as we revealed in our April Fool's Day blog entry HERE, exists with the book, The Hoopa Project. The book is full of innacuracies and flawed logic and bad scholarship, but still many hold it up as one of the best Bigfoot books ever. How can this be? We'll get to that later, but first imagine a few other fields. Imagine a Physicist saying E=MC-cubed, or that Copernicus was an ancient Greek Seaman. Imagine a biologist who denied the basics of Darwinian natural selection, or said that a bat was a bird because it flies. Imagine a baseball player who believed that he got to have four strikes in every at bat, or thought he could run the bases backwards. These concepts just would not be tolerated, would they? So why should we tolerate the ridiculous amount of errors found in a published book such as The Hoopa Project? There are grievous errors on nearly every page we reviewed, as if the author had not even tried to be accountable to the history of the field and the cultural and physical geography of the region he was addressing. Let us say here that we did not attack the author in his person or character. This was a book review! In it we attacked error, illogic, and bad methodology where we saw it. That is all. There was, on the NABS blog page, a backlash effect; but, as we said, we'll get to that shortly. Read on--we know this blog entry is long. Sorry about that! 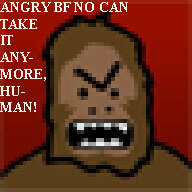 IF I WERE BIGFOOT I WOULD RUN FAR, FAR AWAY FROM ALL OF YOU HUMANS! You might want to do so now, just to soothe your mind, before reading onward on this blog. 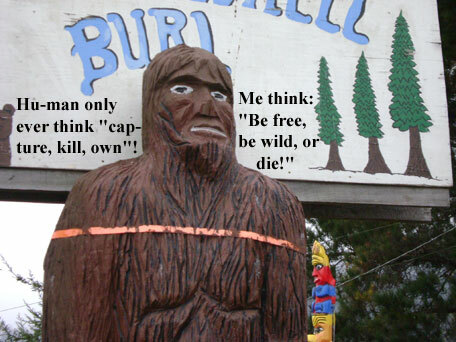 Some of you out there might be surprised that the idea of a Massacre of Bigfoot in Bluff Creek, so roundly and thoroughly debunked by John Green, Bill Miller, and others, is still alive. Well, back from the grave and stumbling like a zombie ready to eat your brain it is. Just check out the GCBRO FORUM for proof (see below for more on that count). 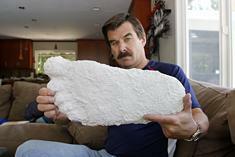 MK DAVIS, originator of this whacky idea, recently spoke about yours truly on his internet radio show on Bigfoot Central. Now WE are part of the CONSPIRACY! What have we done now? we wondered, after getting a heads up from Canadian researcher, Thomas Steenburg. 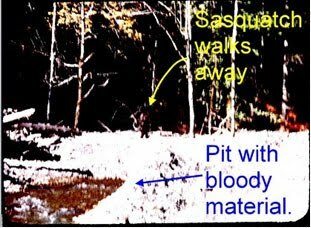 All we had done on our blog was to try to show the early frames of the Patterson-Gimlin Film, and then later we debunked the Bluff Creek Massacre Theory. Now MK is saying that we intentionally inverted these early frames in order to make it look like the creek is flowing in the opposite direction. Why would we even want to do this? To MK and the GCBRO this makes us part of the sinister "cover-up" supposedly orchestrated by John Green. We assure you, dear readers, that we did nothing of the sort. In fact, all we did was take direct screen captures from the YouTube presentation of the BBC X-Creatures documentary. This presentation shows the film being shown on a projector and screen to the host of the show in the home of John Green. So, whatever is in the images we presented is directly as it is on that film owned by Mr. Green. It has NOT been altered. Read the blog entry MK's imagination is objecting to HERE. Listen to MK and Don Monroe make wild suppositions on the air HERE. It is an MP3 file that can be downloaded or streamed online from Artist First/BIGFOOT CENTRAL. Go back through their archives for more astonishing Sci-Fi fun! IMAGES: NOTE PLEASE, to left is one of the screen captures we made from YouTube, showing the TRUE COLORS of the PGF. To right, NOTE, the color-altered, brown-shifted images that MK Davis uses to make the water (seen to lower left in the first image) appear as if it is red, bloody evidence of slaughter. Obviously, it is NOT. Compare the two, see for yourself the origins of MK's Great Deception! THE JERRY PIPPIN SHOW, with MK DAVIS on "The Massacre"
Click the linked text above to hear an even more recent and more mainstream radio show with MK still talking about this unproven, and unprovable, theory. It also can be streamed or downloaded. Who is this Mr. Pippin? Check his main page out HERE. "Most people who have followed "Bigfoot" stories and lore are familiar with the Patterson footage of many years ago. Many have dismissed it as a fake, but one man, M. K. Davis, made it a mission in his life to find out the real story behind this film and the details are astounding and shocking. Davis spent 17 years of his life tracing down the background of how this film was made and his findings are astounding. There was a slaughter of at least six of Sasquatch in Northern California and there was much more to the film than what was shown. Davis believes and authorities are looking at his evidence, the beings are not animals but human beings, trapped in time and shunning civilization. Recently after taking the film in person to be examined by famed photography expert, Bruce Maccabee, Davis feels secure enough now to go public. The Sasquatch/Bigfoot/Yeti is human and many people in Pacific Northwest know and knew it when the logging company was brought in to build roads and they in turn hired hunters who tracked the creatures down and killed them in cold blood. The six killed were a family evidently of this species, hiding in terror with their young and watching as the men systematically killed them with high powered rifles and skinned them for trophy and side show exhibitions." Image: From Roger Patterson's "Do Abominable Snowmen of America Really Exist?" 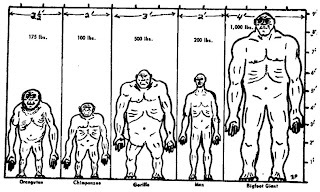 How could a seven to nine foot hairy giant with a flat, flexible foot and other extreme morphological and lifestyle differences be of the same species as us? Just because they are an upright walking primate? Well, is a dolphin a fish? We heard that MK Davis recently had a heart attack, and is recovering. We wish him well. We've always found him to be a good and gentlemanly fellow, apart from these strange accusations of murder by nearly all of Bigfooting's original founding figures. MK, please--it would do your health well if you'd give up these nutty theories! We mean that, sincerely. Other news in the radio show: MK is writing a BOOK about all of this. OMG! BIGFOOT FIELD REPORTER, Sharon Lee, posted a little interview about this subject, following the Pippin Show. Check it out HERE, "The Leslie Mitts Interrogation." There will apparently be a follow-up show featuring critics of the Massacre Theory coming up soon. Read BILL MILLER'S classic debunking of the "Massacre" HERE. Look to the sidebar at upper left to get to our own Bigfoot's bLog INTERVIEW WITH AL HODGSON and the previous INTERVIEW AND DISCUSSION WITH MK DAVIS. There is also an INTERVIEW AND DISCUSSION WITH DAVID PAULIDES OF NABS, another "Massacre" believer. One true and constant voice of sanity and intelligence and critical acumen in the Bigfooting world is that of Dr. Jeff Meldrum. It takes a lot to ruffle his feathers, as he has lucidly defended the possibility (probability) of Sasquatch's existence in the public domain for well over a decade now. Imagine our shock when, on a recent online radio show, we heard exasperation in his voice! It was amazing to us, as we listened in horror, that he did not just come out and call his interlocutor some nasty names. It would have been deserved, it seemed to us. "Join Elusive1 and Evie as they welcome Dr.Jeff Meldrum... and Donna Cohrs as they have a round table discussion on the mid-tarsal break and some other topics, so come and join the chatroom its always a great time in there." 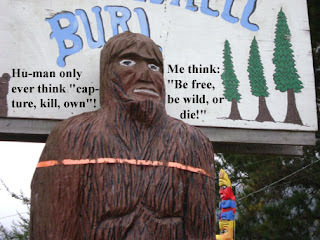 Listen to the Minnesota Bigfoot Research Team's MN.B.R.T. Radio Round Table Discussion (click second linked text to listen) and hear Jeff Meldrum go at it with Donna Cohrs. 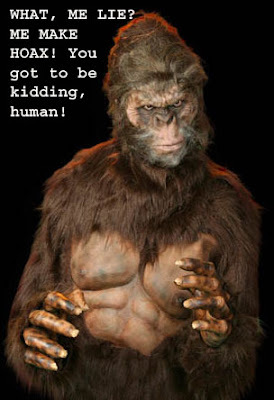 Perhaps nothing in Bigfooting is more shocking than hearing the ever-gentlemanly and patient Meldrum raise his voice, or show irritation or aggravation with an interlocutor. An unfortunate audio level mixing problem makes Cohrs seem quite louder and more shrill than surely she actually would have been in a normal conversation, but that is not all that was annoying about her approach. She may be a nice lady, we don't know; but during this discussion she interrupted Meldrum constantly trying to prove her position that Bigfoot are human, not apes. She accused him of being an arrogant academic, while Meldrum was only trying to answer the points and questions with a rational, reasoned and logical response. It was often rare that he could even finish a sentence before Cohrs would interrupt self-defensively and say "Don't go there," as if he were trying to talk down to her, as if a logical argument were a personal issue. Science is not a matter of opinion, but evidence, Meldrum was trying to say. Once one takes these issues personally, all real intellectual progress dies. Bigfoot creatures may appear to us as human, but that does not mean that they are the same species. Obviously, they are relatives of ours, just as the other living primates are. A foot that looks somewhat like a human's does not mean its bearer is a human. As Meldrum points out, this is only the most superficial analysis of the species made evident by those giant footprint tracks. 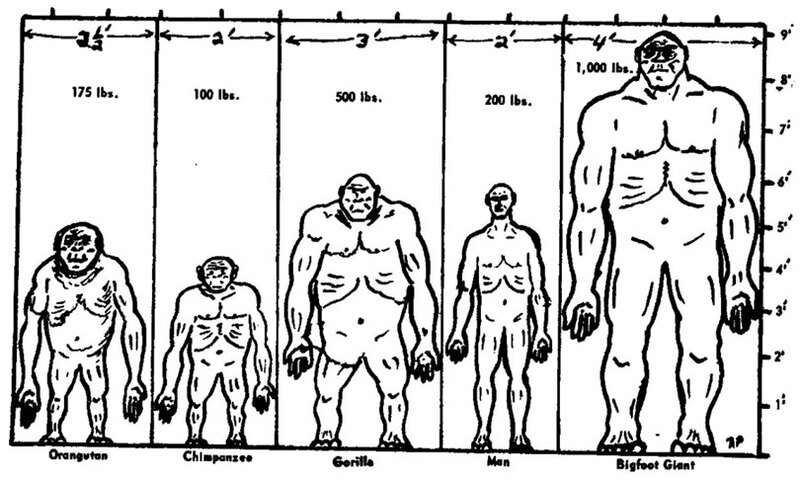 What we are is a primate, an ape that has branched off into what we call the hominid/hominin line. 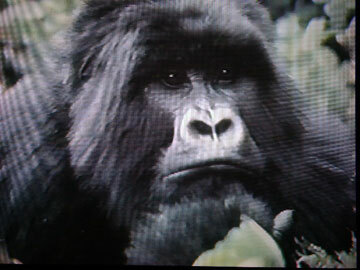 Anyone who has looked into the eyes of a gorilla will have to admit that we are very closely related to them. Their subtle intelligence, feeling, and similarity to us are clearly evident. They are our family, among the animals. One does not have to call a Sasquatch "human" just because it looks or walks somewhat like us, or acts with apparent intelligence. Otherwise you'd have to call a fox a wolf, or a dolphin a fish. It just doesn't work that way, folks. It takes patience and logic, and often decades of learning and training, to truly understand a scientific concept or theory. Jumping in with opinion and emotionalism, before the explanation is finished and the evidence analyzed, gets us all nowhere pretty quickly. GCBRO RIOT IN THE LOONY BIN! Howling from the ramparts of their insane asylum, hiding behind cowardly pseudonyms, the participants of the Gulf Coast Bigfoot Research Organization Forum (see link above, or those below, for the forum) continue to practice their peculiar form of imaginary history under the influence of the dark lord, MK Davis, and that sinister wizard, "Monster Hunter" Jim Lansdale. In their world all it takes to make a theory is the tiniest hint. Often it is what is missing that becomes the ostensible fact; such as: since there are no images in the PGF of Bigfoot falling down in a bloody wounded heap, well, then the film must have been excised, edited and respliced. Think about it this way: when the normal person views the famous Bigfoot film what do they see? We see an animal walking much like a human does, though with many apelike characteristics, walking across the sandbar and into the woods. What do MK and the GCBRO see? A slaughter! A massacre! A sinister cover-up! But where is the evidence? There is none. NONE! A film flaw or blur, a vague hint of color, and suddenly blood and bullets are flying everywhere. The known history of the events in the Bluff Creek basin in 1967 are well known, but somehow all are disregarded as false cover-ups, events and people are conflated and confused, and then a new science-fiction is reconstructed from the puzzle pieces. 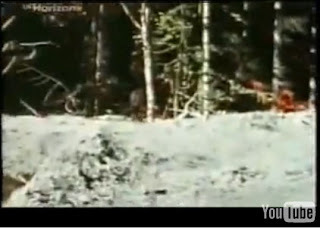 One Bigfoot appears in the film, but MK and his followers see the killing of five or six or more. 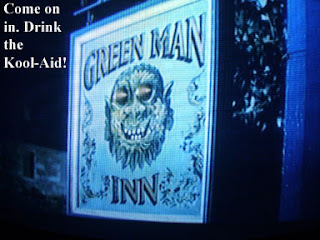 WHERE in the film is this found, guys? Where in ANY of the accounts from the time? Come on! It is all in your imagination. Imagine the JFK Assasination as seen in the Zapruder Film. There, right before our eyes, we see a "massacre" or killing, graphically displayed. Now consider the PGF: we see a hominoid walking, undisturbed by gunfire or wounds--it doesn't fall down wounded, stumble or bleed. What if the JFK film had the president rolling by in his car, unharmed, undisturbed, and exiting the scene under the bridge? Imagine if suddenly a group arose saying that the film depicted the president being killed in gory slaughter. But, you'd say, the film shows him fine, sitting in his car, rolling away from the scene. No, they'd say. Bob Titmus and his crew of shooters were hiding in the bushes. See that blob there? That's him! See that white flash of film flaw? That is the rifle blast. The bullets flew and killed him, but you can't see it on the film because it was all edited and covered up. But the film shows the car rolling straight on through. NO, they'd say--they spliced the film. And look, see this bloody pool...? But, you'd say, that is just grass. No, they'd say---under computer analysis that green is actually red, blood red! And on and on. Once one strange film blob is identified as a gunshot, wound or blood, that's all you need for your next theory--that Bob Titmus has blood on his hands when all colors are red-shifted by computer, that the dog got blood on its foot and left one mysterious bloody footprint (with no others around it) on the sand before the creature in the film. Oh, and look, a piece of bark on a fallen tree becomes a bloody handprint! This is hysterical nonsense. This is not inductive reasoning; it is paranoid free-association, apophenia run rampant, sheer ridiculous schizoid hallucinatory fantasy! And now the GCBRO and Monster Hunter are coming after US, your humble blogger! And for what? Because we interviewed Al Hodgson, and that interview COMPLETELY DEBUNKED the "Massacre" theory they propound. We proved that Bob Titmus was NOT there. There were no bodies, no backhoe tracktors on the site, that the film showing the supposed killers was taken in August-September, and the PGF itself definitely taken in October. Al was there, and he knew these guys, and he knew when they were in the area. There was no Massacre. Granted, we DID call the GCBRO Forum an "internet den of iniquity," so who can blame them for trying to get back at us? However, we called them that because not only were they wrong, but the site hosts a huge collection of cheap slander and lies, fake history, even veiled death threats toward John Green. In any case, you'd think they could at least attack us on some real grounds. No. Rather, they'd just like to call us "evil," a "wretch," "air head," purveyor of "nonsense," or else imply that we are part of this grand cover-up army of John Green. Our publications are "garbage" that they won't publish. Well, we already know you wouldn't publish it, as you cannot tolerate disagreement on your forum, and kick off anyone you don't like. Besides, we wouldn't want the GCBRO knowing all of our personal information, nor where we reside, and they require this. What is this guys? High school all over again? Granted, at one point Al Hodgson points out something that John Green got wrongly in his book. Oh, so HERE is EVIDENCE that Green was lying? Covering up? NO--it is just a simple error of recollection. We all make them. It doesn't mean we are all in some grand Conspiracy. We challenge you, Jim Landsale, to tell us every event that happened on any given day in your life 42 years ago. Can you remember every thing you said, every person you met, and the exact times for everything that happened? Obviously not. No one can do that. And lo! Here they attack our interview. They accuse us of having "no background" on Al Hodgson. Well, that was intentional. There is already plenty of background on Al out there, and you guys already seem to know about it (or think you know, anyway). They accuse us of not doing our homework on the preparation end. What? 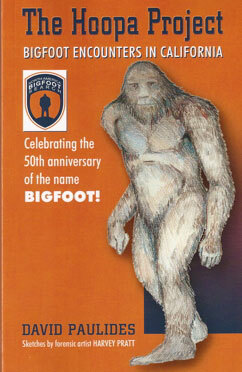 We only read every single Bigfoot book that covers the Patterson-Gimlin film and the Bluff Creek issues. We have done all the conceivable homework we could possibly have done. Plus, we know Al personally, and live in the same town as he. We were trying to EXPLORE the issues and FIND OUT what Al thought and remembered. This is why we do interviews--to learn, not to impose our views on our interlocutor. It's called exploration of knowledge and history; but then, you don't need to do that, do you, since you damned well know "the truth" already, right? And you'll make up whatever you want it to be, anyway. We can't help it if we haven't read every single post on the GCBRO Loony Forum, and nor have we tried to memorize all of your made up "facts." In the "how low can you go" department, now they are posting film clips of Al Hodgson being embarrassed by a scofftic TV interviewer who set Al up to look badly on film. And now they are accusing Al of being senile, thus proving, to them, that anything he says must be wrong. Well, we assure you, Al may not recall everything or everyone's names correctly, but for a guy approaching his nineties he is sharp as a tack! Please, GCBRO, crawl back into your hole and stay down there. Read some of these crazy links for examples. We accept no responsibility for the psychological damage that may be done to the reader of the following GCBRO links. Read at your own risk! Hodgson didn't see Patterson til Oct 20. "There is in human nature generally more of the fool than of the wise." Well, we know NABS is reading our blog. In obvious direct response to our previous THE HOOPA PROJECT BOOK REVIEW, David-we all know who NABS really is-Paulides wrote a blog entry trying to whitewash the situation and direct criticism away from his book and "organization." Well, one must try to confront FACTS rather than PROPAGANDA, that is what we say. Check out his Blog #90, 4/5/2010, Two Choices, paraphrased below. He would like to be seen as taking the "higher ground," even presenting a silly feel-good morality story right out of Chicken Soup for the Bigfooter's Soul at the end. Paulides thinks we are attacking his character. No. His "character" is secondary to us, after the factual errors, methodological blunders, and attitude he manifests in public. We attacked his book where it was deserved, when it made factual or logical errors. We only went after he, himself, in that we felt he was in some ways misrepresenting himself to the Bigfooting world. Respect and prestige have to be earned, not just claimed because of some ostensible superior background. 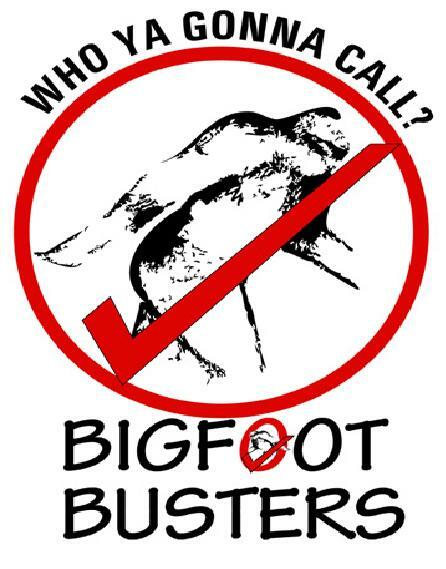 No, he was not the first to discover this that and the other Bigfoot fact or analytical method. No, he is not the only "full-time, professional" Bigfoot organization or investigator. Dave probably knows that his book, at least the introductory section we reviewed, does not hold up under analysis, so he has to cover up that fact with grandiose morality plays and mythic self-portrayals. We mainly want to reserve judgment, hoping he will do better work in the future, but these tactics of legendary self-creation are those of the typical con man. We want Paulides to do better, to earn his chops, to keep doing interviews with witnesses. "Folks, we at NABS have our flaws, as everyone does. Most of us have children and we attempt to live a life that’s a model for our kids to follow. Most of us volunteer a significant amount of our time to a non-profit cause of our choice, it keeps us grounded and humble. We don’t want to leave behind a trail of destruction and negative interactions, but, a positive impact on every person that we meet. Part of being a good businessperson is the ability to converse with all levels of society, and, doing this effectively and in a positive manner. When we leave this arena, when our mission is accomplished, we do not want to be known as a group that believed in speaking negatively about others, spreading rumors, bashing competitors or attempting to assassinate the character and good name of people by trashing their work, there is NOTHING productive in this approach. As NABS has stated since their inaugural year, this puzzle will only be solved through mutual coroboration and cooperation, this is turning out to be true. We won’t be a group that stays in this research area for the life of their founders. We came here for a specific goal, once that is accomplished, we will leave for our next venture, and, there are many ahead." It has become obvious that Paulides is insecure about his work. What a fragile ego he must have. All we had done is point out errors in his book, but here he begins to talk about his family and community, as if this had anything to do with research or scholarship on the Bigfoot topic. That is NOT what we were talking about. Imagine a world without debate, where no one could do any peer review or fact checking without getting into ego-based soap operas. How would knowledge ever progress? But, it seems, this is the fantasy world that NABS exists within. Image: From Cryptomundo.com, via Cupertino Courier. Note, too, that he wishes not to leave a "trail of destruction and negative interactions" behind him. Why, then, does almost every Bigfoot event he goes to leave behind such impressions of him? It is odd, but we suppose one applies the whitewash to the very area where one feels vulnerable or wrong. The "productivity" WE seek, in contrast to NABS, is the pursuit of the facts, of the truth, not some public image that will help us sell books or speaking engagements. Is NABS just a public relations-marketing effort, or do they really care to know about Bigfoot/Sasquatch and its history? Do the facts matter? Or is it all the activities of a merchandizing campaign, as Paulides indicates in his strange use of the word, "businessperson"? If you want examples of negative interactions and unproductive attitudes Mr. NABS has manifested just see below for the Cryptomundo link, or read our previous blog entries about him (use the SEARCH THIS BLOG box, above, or start HERE). These sorts of actions or flawed publications do NOT advance the field. They don't advance any field of knowledge, and would be laughed out of class in any branch of Science. Nor does NABS, in our experience, practice "mutual coroboration and cooperation"--in fact, they are the most secretive and paranoid Bigfooting "group" (we should say, really, individual) out there. In our interview with him he refused to talk about current projects or issues, and would only deal with the past. Go figure. A person can say anything, but it is what is true that really counts. In that blog he quotes an "elder" saying, "It isn’t what you do in the public forum that truly matters, it’s what you do when nobody is watching that defines character," OK, well, Dave may be a good guy, "in secret," when no one is watching, we'll admit it. We don't really know him personally, and really couldn't care less. We are not questioning his character. Rather, we say, if you are going to enter an area of public research and debate then it DOES matter what you do and say in the public forum. This is what that area of research is ABOUT! If we cannot resolve matters of truth and reality in a field, in published documents of that field, then that field is doomed to inanity and irrelevance. Not only can he not field questions about his book, or acknowledge fact-checking of it, but now he has felt compelled to present a whole slew of postive reviews of The Hoopa Project on his web site, as if this will deflect the serious and fact-checked work we did in reviewing his book. Sorry, Dave, but the facts are the facts, and they cannot simply be changed, nor used sloppily in shoddy "scholarship." The facts ought to be respected in a "reality-based" world. No? If we make mistakes on this blog please let us know. We will admit it if it is true, and make corrections. He doesn't mention on there, though, that Loren Coleman has since revoked and rescinded his award for Cryptozoological Book of the Year for The Hoopa Project. Oh well. Nor does he mention that several of the reviewers on his page have since changed their opinions about Paulides or his book, such as Linda Martin, of Happy Camp. Oh well. Yes, we, too, liked the book when we first read it; that is, until we looked more deeply at it, and looked into the circumstances of its production. Then we began to change our view of the thing. Most of the reviews he presents are early ones, based on first impressions. As we get over the initial "cool" factor the underlying problems become evident. We have heard locally, living as we do only 11 miles from Hoopa, that many of the people in the book "did it for the money." Was Paulides paying for Bigfoot stories? We don't know for sure if this is true. We heard a figure of $200.00 mentioned. Anyway, we are sure that most of those stories in the book are from sincere people who had real Bigfoot encounters; but how can one be sure? When facts and methods begin to seem incredible, then the whole edifice begins to collapse. Recently some news about one David Paul Paulides' past as a police officer (we assume this is the same Paulides, as how unlikely is it that there were two with such a name in the same police force?) crossed our desk. Our initial response was NO COMMENT. However, since he has blogged about that, too, we feel we'd better comment after all, to the extent that we legally can, about these allegations. Some of this stuff has not yet been fully verified with public court, police and newspaper records. However, we can tell you what, so far, has been discovered in the archives of the San Jose Mercury News. The recent news started with an anonymous tip from someone who lived in the same community, back in the day, when these things became a public issue in the newspapers. That anonymous person had much to say, but his/her identity has been protected. What can be said is that at one time Paulides (if this is the same Mr. Paulides we are talking about here) was accused and surrendered himself into temporary custody over an incident that involved impersonating the head of a police charity in order to obtain signatures and collectible memorabilia from celebrities. The article for this one HAS been found, but nothing as yet confirming the outcome of the case. Here is the link to a public synopsis of the archived article. Result #6 is the one in question. Or see for yourself. Go to http://nl.newsbank.com/ and type in David Paul Paulides. S.J. OFFICER ACCUSED OF FALSE SOLICITATION AUTOGRAPHS: A FORCE VETERAN ALLEGEDLY USED CITY STATIONERY TO ASK FOR MEMORABILIA. "None of those activities fell within his duties as a court liaison officer, prompting an internal investigation that began last September. 'He's an autograph hound,' said Assistant District Attorney Karyn Sinunu, who filed the complaint last week in Municipal Court. 'It was a stupid thing to do - to spend your time enhancing your personal collection when taxpayers are paying for you to work.'" "Police spokesman Officer Louis Quezada said Paulides is on vacation. Quezada could not say what sort of job action the department might take against Paulides. Jensen, however, said possible repercussions range from disciplinary action to termination from the department where Paulides has worked since 1980. Paulides surrendered to authorities last week and was released. He is expected to be arraigned next month in Municipal Court." This is PUBLIC RECORD. Take it for what you like. The full article is a pay-per-view thing. However, this article and the other one mentioned in the Crytomundo entry linked below WERE found at a public library that allowed free access to the news archives. Another anonymous researcher found them that way. Check your local library to see if they do this, too. We'd post the full articles here, but they are copyrighted. Investigators behind the scenes are digging more deeply into these alleged issues with inquiries with the SJPD and San Jose City Hall, so we will reserve comment for now. These things are hardly related to Bigfoot, anyway; but if they are true they do call into question to some degree the stated background claimed by the author of The Hoopa Project, and perhaps even the credibility of NABS. We shall see where the investigation leads. The anonymous source's email alleged "Fired, Not Retired." As we said before, we don't know yet what the result of this issue were, and they may have to be found in microfiche recorded archives on site in the South Bay. Cryptomundo.com blogged about this as we were pondering what in the world to say about it all. That sure took a load off our shoulders. Digging for Dirt? …or Looking for Bigfoot? There is another case mentioned in the Cryptomundo piece, but we don't want to comment on that one. There are difficulties in police work that we non-police cannot really understand. One has to feel for a guy who got attacked by a suspect and had his face beaten and teeth broken by a psycho. However, whether this justifies an apparent organization of a goon squad in retaliation is another question. Just so you know, no action was taken against the officers involved, though protests were raised from within the African-American community about alleged police brutality. No one is perfect. Dirt can be found in anyone's past, most likely. We ourselves and our friends were even once questioned by the FBI for doodling on a napkin in a brew pub. Hilarious! Unfortunately the newspaper archives for that one seem to have gone missing from the ARCATA EYE web site. We have, in the interest of fairness, inquired with the editor to see if we can find a living link for this fun story. He assures us they will be posted soon. We assure you, too, that we are not a terrorist, and those drawings of nuclear power plants were simply drunken fun! Paulides, on his blog responds to this Cryptomundo posting. Look for Blog 91 on the NABS blog page. Right now it is quite near the top. "The last 72 hours have been an interesting stretch for NABS and our researchers. We have continued to get positive reports from our project leaders while others in our arena have decided to attempt character assassination. ... The last 3 days has brought a number of emails from supportive followers all stating the obvious, 'don’t lower your self to address obvious personal attacks.' ... Why would any professional want to be publicly slammed for something they were accused of 23 years ago when in FACT they were completely exonerated and cleared, close the book. Folks, there is a group of people in our community that call themselves “researchers” and “writers” that have spent an excessive amount of time and energy doing one thing, trying to publicly assassinate NABS and their personal. ... When a defense attorney doesn’t have a defense for their client, they don’t try the case facts, they put the witnesses to the test, and, this is what is happening here. We aren’t seeing attacks on our affidavits, witness testimony, hypothesis, or behavior statements, instead, these people have put their energy into trying to character assassinate our researchers, unbelievable. Another comment made by this group of individuals is that our researchers have made mistakes, big mistakes. Namely, there is a serious allegation that one of researchers doesn’t hold the credentials he has claimed. Let’s clear the air now, NABS, our researchers and our research do not lie, PERIOD. We came from a background that holds honesty at the highest level. ... Paulides had over 45 commendations during his 20 years in law enforcement, and, one of the most commended officers on his department when he left.... Neither man [Paulides and Harvey Pratt] has a criminal conviction for anything more then a parking ticket, read this again, neither man HAS EVER been convicted of anything more then a parking ticket, ever! ... Paulides spent 20 years in law enforcement and chose to retire, obtain his pension.... As we have stated on this site in the past, DO NOT believe anything you read about NABS or our personnel unless we have printed it here. ... Please don’t ask us to personally attack anyone over any issue, it won’t happen. We believe that the research (or lack of) that has gone into each group’s hypothesis will eventually be the sole factor that pushes that group decisively to the top." Notice how he goes on a straw man attack rather than addressing the historical record. Notice, too, how he addresses the events of 23 years ago (the 1987 accusations of police brutality), and NOT the later one from 1996 for which he was so far as we can find on record charged, held for a time in custody, and later arraigned. Was he fired from the police department for this latter issue? We don't know yet, but the truth will out, either way. If so, then would that not call into question his claimed pretigious police background that is supposedly so important to his Bigfooting activities and the source of his methods? We don't question that Paulides was an effective policeman, as it seems he was; but rather, we wonder if he has been entirely forthright with the Bigfoot world. If he was fired, as alleged, then why does he repeatedly say he "retired"? Why does he NOT address the later, 1996 episode? Also, we'd like Paulides to consider that the previous criticisms we and other made against him were over issues in his Bigfoot works and methodology, his belief in the "Bluff Creek Massacre Theory," and his public behavior among bigfooters and at Bigfoot conferences. These other issues came up without being sought after; but as they seemingly indicate a potential dishonest tendency then, yes, they are relevant to the Bigfooting field. Just as you would want to know the references and credentials of the contractor working on your house, so too should the readers of any NABS product want to know if the whole truth about the author's police background were being told. Since he makes extraordinary claims about his investigative background, and does so to put himself above other BF researchers or groups, it’s only natural that some would want to check his credentials. Does the truth matter? Do the facts matter? Do reality and logic come first before fantasy and propaganda? We surely hope so! And as we've said, THE TRUTH WILL OUT. We shall see, come what may. Read our previous INTERVIEW WITH DAVID PAULIDES here. See how we once tried to be nice with this fellow. "Truth will come to light; murder cannot be hid long; a man's son may, but in the end truth will out." Me already spoke. Me say most of what in this blog. Hu-man guy in bookstore only copy what I say. Me angry, OK? That all you need to know. That all you hu-man can handle. 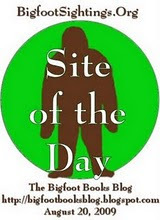 This weblog, website, soapbox, or whatever you call it is copyright 2010, Steven Streufert, Bigfoot Books Intergalactic. Sharing and borrowing is allowed (and often practiced by us, too) if you give full credit and citation, and a fair and nice link back to our page. Thanks!